One day I had a few minutes before I needed to go to an appointment, so I decided to clean out my purse. Do you know what I found? I found a gift certificate someone had given me that I had completely forgotten about! I remember when the individual gave it to me. I was excited because it was for something that would benefit my life. But then I tucked it away in my purse for safekeeping and completely forgot about it. I could not benefit from the gift certificate until I remembered that I had it and then put it to use. God has given us many wonderful blessings in His Word. I like to think of them as gift certificates. 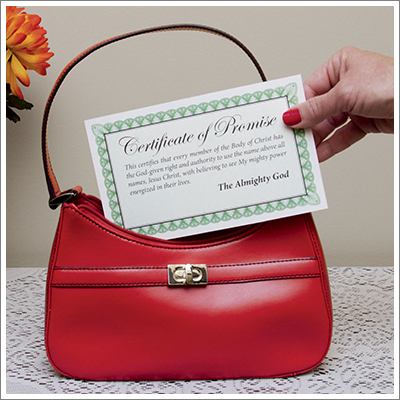 A certificate, according to one dictionary, is a document testifying to a fact, a qualification, or a promise. It certifies or guarantees in writing the truth of something—for example, that you are entitled to what the certificate states. God’s Word certifies in writing that God has given us many wonderful promises for our lives that He doesn’t want us to tuck away and forget. He wants us to keep them in plain sight and not forget what we have so that we can use them when we need them. One thing God wants us to know and remember is the power available to us in that name above all names, Jesus Christ. He wants us to know the reasons we have this power and that we have the authority to use it. First, let’s look at some details concerning Jesus Christ that will show us his credibility and accomplishments. When God raised Jesus Christ from the dead and set him at His own right hand, He gave him a name far above every name that is named, not only in this world, but also in that which is to come. By having “the eyes of your heart flooded with light,” as rendered in The Amplified Bible in verse 18, we can know and understand the Hope to which God has called us and the richness of His inheritance in His children. God wants us to know and understand the immeasurable and unlimited and surpassing greatness of His power in us and for us who believe—the power He exerted in Christ when He raised him from the dead and seated him at His own right hand, far above all rulership and authority and power and dominion and every name that is named, not only in this world, but also in that which is to come. That’s some power! There has never been anyone else who accomplished what Jesus Christ did, and there is no other name but the name of Jesus Christ whereby an individual can be saved. Throughout history there have been many noteworthy individuals who accomplished great things. We can learn from them, admire them, and even emulate their godly qualities. But as great as they may be or may have been, none of them could take a person from being dead in trespasses and sins to having everlasting life. This is an excerpt from the November/December 2014 issue of The Way Magazine.